Marianne is a symbol of Republican France, as ordained in a Decree of 1792. The decree, adopted after the proclamation of the Republic, decided that the seal of the Republic would be a picture of a woman representing the goddess Liberty. "The seal of the State ... will carry a symbol for France with features of a woman." Decree of the Convention of September 21, 1792. The Republic was to be represented in the guise of a woman wearing the Phrygian cap, emblem of Liberty. The first mention of Marianne as a symbolic representation of the Republic appeared in Languedoc between late 1792 and 1794. 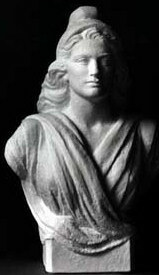 A Marianne is a bust of a proud and determined woman wearing a Phrygian cap. She symbolises the attachment of the common citizens of the revolution to the Republic - Marianne is liberty, equality and fraternity. For information about how Marianne was, and is, represented on French postage stamps, go to Marianne, a French national symbol, with French definitive stamps. The Convention, in 1792, decided to represent the Republic in the guise of a woman wearing the Phrygian cap, emblem of Liberty. Marianne's familiar nickname was given to her at the same time, in Languedoc first, by the "vox populi". No doubt because this name, formed by the name of the Virgin and her mother, was widespread in the small people in the eighteenth century, and it was therefore appropriate for the young Republic that was born. The custom of installing a bust of Marianne in town halls dates back to the early years of the Third Republic. But in 1871, to give the new regime a wiser picture, President Adolphe Thiers banned the representation of the revolutionary hat, considered a "seditious emblem". This is why the oldest Marianas de mairie are simply wearing a vegetable crown made of wheat ears, oak leaves or olive branches, sometimes surmounted by the star, symbol of the Enlightenment. The Phrygian cap will not reappear until 1879. There has never been an official bust of the Republic. Each sculptor is free to represent Marianne in his own way and each mayor is free to choose his model. This explains the extraordinary diversity of town hall busts. Recently, fashion has wanted to give Marianne the traits of famous artists, but she has had many other faces, kind or severe, and always anonymous, as evidenced by this exhibition. In the nineteenth century, Marianne was the subject of a popular devotion. Many small busts of bronze or plaster were found in commerce, and among the fervent republicans, like the crucifix or religious statuette in Catholic homes. This production for domestic use has totally disappeared. Marianne started to reappear as the representation of France in town halls from 1877, replacing the statues of Napoleon III. 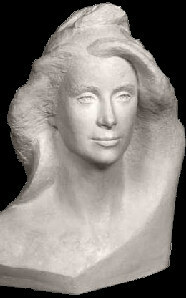 During the twentieth century, busts of Marianne gradually appeared in every French town hall, and other public buildings such as libraries. At first, it could not be decided whether Marianne should appear revolutionary and wear the bonnet of Liberty (the Phrygian cap), or whether she should be the bountiful Earth Mother (like Ceres) and wear a wreath of wheat-ears, so her bust came with differing headdresses. Now the consensus is that she represents Republican values (Liberty, Fraternity and Equality) and always wears the Phrygian cap. 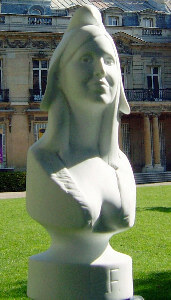 In France, a Marianne statue is known as a "Bust of the Republic". Frequently, she is also adorned with a tricolour sash, as worn by every French mayor on official occasions. The reproduction statues are made from plaster, and can have coatings added to make them look more aged, or more valuable (see the Casta bust). When not named after the model, as has been the case recently, the Marianne busts are named after the sculptor. One of the less-frequently mentioned attributes of the Republican symbol, Marianne, is her breasts. How the representation presents her mammaries is symbolic both of the mood of the Marianne, and of the Republic of that era. So Delacroix’s Marianne could be regarded as defiant and proud, displayed in protest; while on the Great Seal of State, Marianne is dignified and subservient to affairs of state . In general, “the Republic prefers an opulent, more maternal breast, with its promise of generosity and abundance” . The idealised, symmetrical breasts even become another symbol of equality! There is a collection of 19th and early 20th century busts of Marianne at the website of the Assemblée Nationale - the French House of Commons (Lower House). 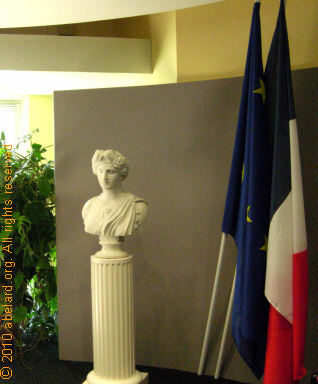 A bust of Marianne in the Salle des Fêtes, part of the Mairie [town hall] of a provincial town. The Salle des Fêtes is used for meetings, including civil marriage ceremonies. Each sculptor was free to represent Marianne in his own way, and each mayor is free to choose their bust.This explains the extraordinary diversity of busts in town halls. It was only in the second half of the twentieth century that well-known French women were used as the model for busts of Marianne. 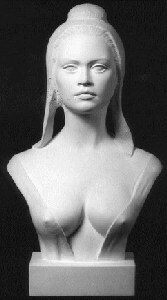 The first, of Brigitte Bardot, was apparently done as a joke by the sculptor, Alain Gourdon. More recent models have been chosen by balloting the mayors for their preference (for instance, Évelyne Thomas). Here are the famous Marianne models, with images when available. The mayors’ association of France voted for Florence Foresti, an actress and comedienne, to be France’s next Marianne. This vote has to be ratified by the State. The runners-up were Carla Bruni-Sarkosy, Laure Manaudou and Rama Yade. This site (in French) all the trappings for running a well-appointed French town hall, from sashes, bunting and medals to voting boxes. 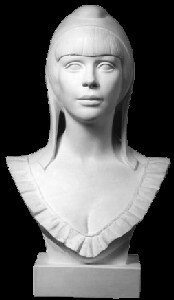 The company also sells busts of different Mariannes, this page is the entry to the Marianne emporium. In 1871, to give the new regime a more thoughtful and wise image, President Adolphe Thiers prohibited the representation of revolutionary cap, considered a “seditious emblem”. This is why the oldest town hall Mariannes are simply wearing a vegetative crown composed of wheat ears, oak leaves or olive branches, sometimes surmounted by the star symbol of Enlightenment. The Phrygian cap not reappear until 1879. In 1792, a decree stipulated that the State Seal be changed and bear the figure of France in the guise of a woman dressed as in the fashion of Antiquity. She should be standing upright with her right hand holding a pikestaff surmounted by a Phrygian bonnet, or Liberty bonnet, her left hand resting on a bundle of arms, and at her feet, a tiller. Note that the woman is not named Marianne in 1792, and that the woman on the seal is in fact sitting, rather than standing. Quoted from writer/historian Maurice Agulhon. This Marianne’s full name is Inès Marie Laetitia Églantine Isabelle de Seignard de la Fressange. “[...] the new Marianne did not believe in equality. “Equality in France meant trying to fit everyone into the same mould, she said.